What to Buy: There are many different types of mustard. Here’s a rundown on some you’ll find in your favorite grocery store. Yellow Mustard: This is the type of mustard we might get in a restaurant, also known as Yellow or American Mustard. It gets its bright color from Turmeric (or artificial coloring) and we generously squeeze this stuff onto street hot dogs. Extremely mild in flavor and intensity, it is healthier than ketchup and mayonnaise. So use this instead in your sandwiches and hotdogs. Sweet/Honey Mustard: The favorite dipping mustard for french fries that also happens to be my top choice. If you like salty-sweet flavors, then drown your food in this. Not quite as healthy as its other family members, it does come in interesting flavors such as ginger and brown sugar. I highly suggest (if you’re feeling adventurous) that you try your hand at honey mustard ice-cream: it’s like salted caramel, but better! Dijon Mustard: Originally from a part of France called Dijon (surprise! ), it traditionally has red or white wine mixed in. However, now Dijon mustard-makers sometimes substitute acid or vinegar. It definitely has a nice kick and if you enjoy wasabi, then Dijon Mustard is your go-to yellow friend. It goes well on your sandwiches and hotdogs, but I actually find it makes a great replacement for wasabi (die-hard sushi fans please do not try this at home). Whole Grain Mustard: The most textured type of mustard, you can recognize this type by its speckled appearance. Its black-flecked seeds are mustard seeds mixed in with the mustard sauce. I really enjoy using this as a rub or a marinade for fish or meat. The grains give a nice crunch in the oven when you bake or broil it. 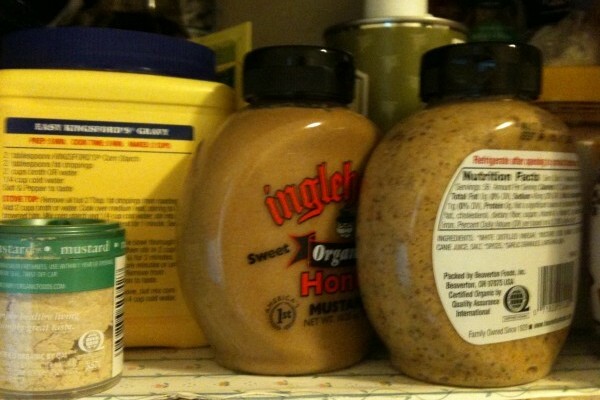 I also once bought a really high-quality jar of honey whole grain mustard from Amsterdam and used that instead of jam. If you’re a big fan of whole grain, I think you’ll find this worth the investment. How to Cook: This flexible condiment can be used for anything! You can use it in marinades, salad dressings or as a classic dip. While you can use any mustard, some pair better than others so be sure to read the guide above. Alternatively, if you’re just a big fan of the mustard flavor, try using mustard powder in addition to mustard sauce to enhance the subtle flavor. Try getting an extra kick out of this sauce by using Dijon mustard. Honey mustard gives this salad dressing a bright and vivacious color — and some welcome tang. This vegetarian main uses whole grain mustard for a richer flavor. A classic side dish perfect for a tailgate! Any mustard would be perfect as a condiment in this warm, melty sandwich. Stephanie is a recent adoptee of the pescetarian slow-carb diet. She likes pretending to be Danish and as a result eats lots of Danish Dream Cake. In her spare time, Stephanie likes shopping for her ever-expanding mustard collection. Don’t forget about the wonderfully delicious horseradish mustard! Links We Love : College Cures | Everything College, No Prerequisites.